September 4th: fair. As soon as we leave the inn, we notice that summer is over. The valley is rich with deciduous trees but their leaves are turning yellow here and there, and the shoulders of the road are already covered with fallen leaves. Conifers become dominant as the sea gets closer, but the sunlight they let through is unmistakably that of autumn. We follow the twisty road in and out of woods, and then something that looks like a dense layer of fog comes into view, floating over a little hill ahead, below the clear sky. When it eventually turns out to be one enormous stratus, we're on the coastline of the Pacific. The winding cliff road goes up and down, occasionally taking us above the cloud. September 5th: sunny. Seen from the window of the inn overlooking a cove, the highway looks like Route 134 in Japan's Shonan area. This echo across the ocean reminds me of our journey's end, but I forget it all as soon as I start up the bike. The sky along the coast is blue and cloudless. The northbound road takes an inland route for a while and connects to US 101. September 6th: sunny again. We ride up north on US 101 and enter the state of Oregon, home of the film Stand by Me . A railroad track appears and runs parallel to the road, and we can't help singing the Ben E. King song. September 7th: fair. 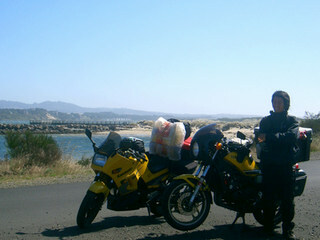 We leave the Oregon Dunes N. R. A. on the coast, headed for the city of Seaside just below the state border. We ride along the coastline, blown at times in the brutal, chilly side wind from the ocean. The road goes down from a cliff top to a sandy beach, to a rocky beach, and up to an inland pasture and so on, alternating between the smell of livestock and the sea breeze. September 8th: a day off in Seaside. We go touch the water of the Pacific on the windblown beach. September 9th: fair. This is our last ride, entering the state of Washington now, bound for an island west of Seattle. We ride through the city of Aberdeen and get on a ferry from Southworth. While twilight deepens, we shut off the engines of our motorcycles and stay with them all the way across the quiet waters. We made it to the ocean: this must be the Pacific. When we got on Highway 1, the ocean was hidden behind a thick belt of fog or cloud and we couldn't see it at all. Now we can feel the arrival of autumn as the temperature is noticeably lower, and inland trees were already shedding their leaves. We're headed towards Seattle, up north along the Pacific coast. Riding on seaside roads is refreshing, but it feels a bit too cool in the strong wind. The picture here was taken by the water in Oregon Dunes National Recreation Area. Currently we're in a town called Seaside, just below the state border of Oregon and Washington. On the 9th, our 32nd day on the road, our coast-to-coast ride ended as we arrived at Vashon Island near Seattle. Thanks to your encouragements, we've finished our trip safe and sound. Now we only need to find new owners for our bikes. We're finally at rest, now free from the task of getting ready for the next day.